In 1965, Gordon Moore predicted that engineers would be able to double the number of components on a microchip every two years. Known as Moore’s law, his prediction has come true – processors are continuing to become faster each year while the components are becoming smaller and smaller. In the footprint of the original ENIAC computer, we can today fit thousands of CPUs that offer a trillion more computes per seconds at a fraction of the cost. This continued trend is allowing server manufactures to shrink the footprint of the typical x86 blade server allowing more I/O expansion, more CPUs and more memory. Will this continued trend allow blade servers to gain market share, or could it possibly be the end of rack servers? My vision of the next generation data center could answer that question. Before I begin, I want to emphasize that although I work for Dell, these ideas that I’ve come up with through my experience in the blade server market and from discussions with industry peers. They are my personal visions and do not reflect those of Dell nor are the ideas mentioned below limited to Dell products and technology. Last November I wrote an article of my first vision of “The Blade Server of the Future” on CRN.com. In the article, I described two future evolutions of the blade server. The first was the integration of a shared storage environment (below). 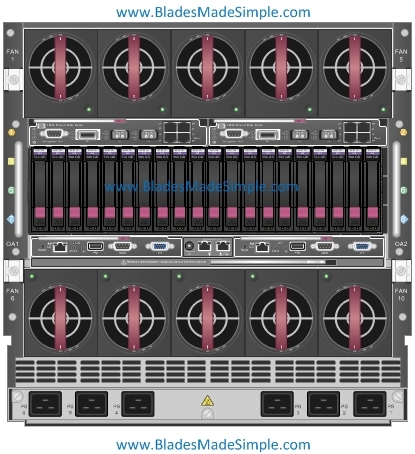 While the image depicts the HP BladeSystem C7000 modified with storage, my idea stems from the increase of onboard NICs driving a lot of the individual blade traffic. With 10Gb / CNA technologies being introduced as a standard offering, and with 40Gb Ethernet around the corner, the additional mezzanine cards and I/O expansion found on today’s blade server technology may not be required in the near future. The space freed up from the removal of the un-needed I/O bays could be used for something like an integrated storage area network, or perhaps for PCI expansion. PCI expansion is another possible evolution within the blade server market. As CPUs continue to shrink, the internal real estate of blade servers increase, allowing for more memory expansion. However, as more memory is added, less room for I/O cards is available. While I mention that additional I/O may not be needed on blade servers with the standardization of large onboard Ethernet NICs, the reality is that as you cram more into a blade server, the more I/O will be required. 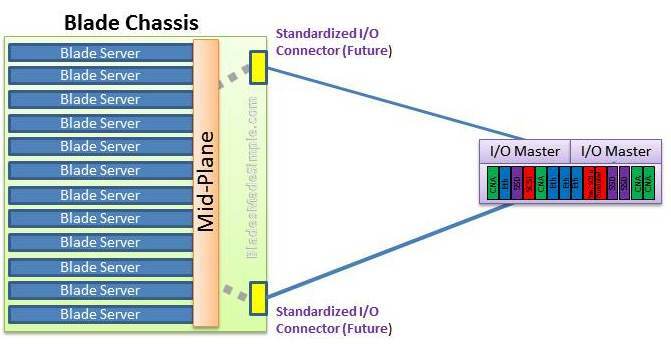 I believe we’ll see external I/O expansion become standard in future evolutions of blade servers. Users of RISC technologies will be quick to identify that external I/O is nothing new and in fact, even in the x86 space has been an option through Xsigo.com however my vision is that the external capability would be an industry standard like USB or HDMI. While the idea of a standardized external I/O capability like shown in the image below is probably more of a dream than a reality, it leads to my long term vision of where blade servers will eventually evolve to. On the front side of the modular rack, a user would have the option to plug in whatever is needed. For servers, I envision half-size blade servers housed in a 1 or 2U shelf. The shelf could hold any number of servers, but I would expect that a shelf of 8 – 12 servers would be ideal. 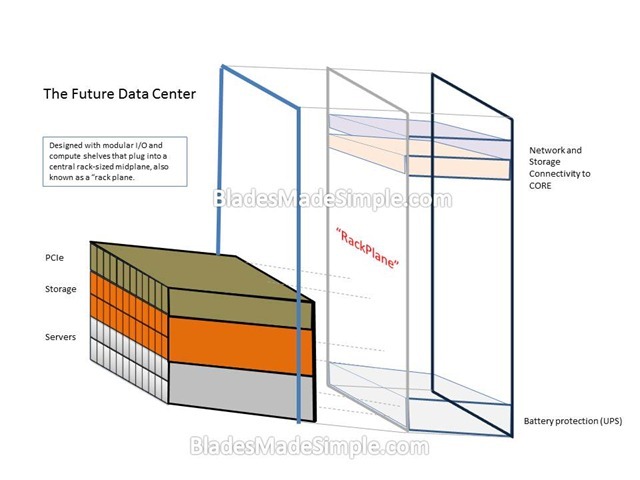 Keep in mind, in this vision, all we need are CPUs and memory inside of a “blade server” so the physical footprint of the future blade server could be the size of today’s full-length PCIe card. Each of the shelves, whether they are servers, storage or compute, would have docking connectors similar to what we see on today’s blade servers but on a much larger scale. On the back side of the modular rack, you would have the option to add in battery protection (UPS), cooling and of course, I/O connectivity to your data center core fabrics. What are your thoughts on this? Am I totally crazy, or do you think we could see this in the next 10 years? I’d love your thoughts, comments or arguments. Thanks for reading. Kevin Houston is the founder and Editor-in-Chief of BladesMadeSimple.com. He has over 14 plus years of experience in the x86 server marketplace. Since 1997 Kevin has worked at several resellers in the Atlanta area, and has a vast array of competitive x86 server knowledge and certifications as well as an in-depth understanding of VMware and Citrix virtualization. Kevin works for Dell as a Server Sales Engineer covering the Global 500 market.